Walk the Talk is a series of themed, facilitated walks exploring topical social issues while enjoying the landscape and wildlife on the edge of Clifton. Our group meets on a monthly basis and consists of the members of the general public as well as representatives from local agencies and community organisations. 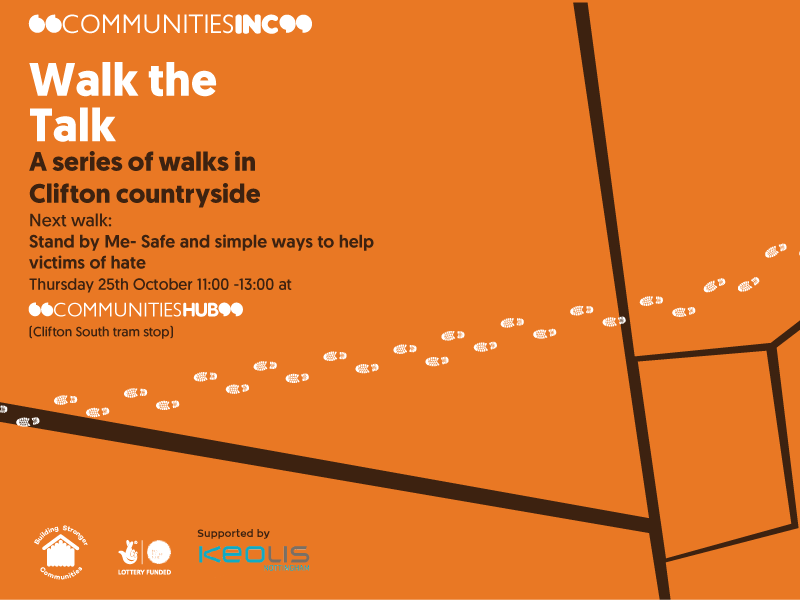 Walk the Talk is a great opportunity to discuss current social issues and learn about the work being done across Nottingham while improving your wellbeing. Following National Hate Crime Awareness Week the theme is ‘Stand by Me- Safe and simple ways to help victims of hate’. We will be joined by Bystander Intervention Ambassadors from our Stand by Me project to discuss bystander interventions and how those benefit individuals and communities. At the end of the walk, we will provide you with refreshments and record key points discussed during the walk. Those travelling to the walk by tram are entitled to purchase an ‘event ticket’ at a reduced price but to do so your place must be booked beforehand via Eventbrite and your receipt shown to the ticket inspector if requested. Please wear sensible footwear and clothing. We will be leaving the Communities Hub at 11:10. Next Why are bystander interventions important in tackling hate crime?